PRESS RELEASE: BIMM has three different Summer Schools running in August 2010 and places are selling out fast! Our programmes, which have been running for eight years, will offer you the opportunity to study technical development and live performance skills in vocals, drums, guitar or bass. Keyboards are also offered for the Total Guitar Summer School (BIMM Brighton) this year. You will be using industry standard equipment whilst being taught by some of the biggest names in modern music. 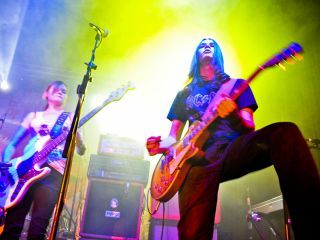 BIMM tutors and guests have sold hundreds of thousands of albums signed to major and independent record labels, had chart hits, toured the world and hit the main stage at Download, Glastonbury, Reading and Ozzfest, recorded dozens of Radio 1 sessions, as well as having their music in films on TV and in video games. Check out the official BIMM website for more info. Every student receives a personal Summer School certificate. Mark Clayden BIMM Bristol College Manager and founding member of Pitchshifter and This is Menace said: "The summer schools are awesome, the tutors and guests help to cut away all the myths and get down to the basics of making you a better player"
You will be studying and playing pop, rock, indie, blues and funk, including songs in the style of: Deftones, The Killers, Kings Of Leon, Oasis, Bloc Party, Babyshambles, The White Stripes, Kaiser Chiefs, Funeral For A Friend, Lostprophets, Enter Shikari, Fightstar, Paramore, Red Hot Chili Peppers , Alice In Chains, The Kooks, Franz Ferdinand, Biffy Clyro, Yeah Yeah Yeahs, At The Drive-In, Arctic Monkeys, Feeder, Led Zeppelin, Lenny Kravitz, Jimi Hendrix, U2, Queen, Eric Clapton, Foo Fighters, Green Day and more. Ibanez is also offering one free RG Series Limited Edition guitar for the Total Guitar Summer School to one lucky winner and there will be amazing prizes from Peavey. You will be studying and playing pop, rock, indie, blues and funk, including songs in the style of: Deftones ,The Killers, Kings Of Leon, Oasis, Bloc Party, Babyshambles, The White Stripes, Kaiser Chiefs, Funeral For A Friend, Lostprophets ,Enter Shikari, Fightstar, Paramore, Red Hot Chili Peppers , Alice In Chains, The Kooks, Franz Ferdinand, Biffy Clyro, Yeah Yeah Yeahs, At The Drive-In, Arctic Monkeys, Feeder, Led Zeppelin, Lenny Kravitz, Jimi Hendrix, U2, Queen, Eric Clapton, Foo Fighters, Green Day and more. Ibanez is also offering 1 free RG Series Limited Edition guitar for the Total Guitar Summer School to one lucky winner and there will be amazing prizes from Peavey and Brighton's GAK - Guitar Amp and Keyboard Centre - who will also be providing goodie bags, as well as a GAK discount card! You will be studying and playing songs in the style of: Metallica, Trivium, Down, Iron Maiden, Slayer, Lamb of God, Airbourne, Black Sabbath, AC/DC, Lamb Of God, Gallows, System of a Down, Mastodon, Kiss, Rammstein, Steel Panther, Cancer Bats, Devildriver, Clutch, Skindred, Down, Porcupine Tree, Bring Me The Horizon, Dragonforce, Saxon, Megadeth, 36 Crazy Fists, Bullet For My Valentine, Sikth, Therapy, Slipknot and more. This year sees BIMM endorsers Orange Amps offer up some incredible prizes for the best guitarist. The stack consists of the Orange Tiny Terror Head and 1 x 12 cab (there are also 5 swag bags for the runners up) Brighton's GAK - Guitar Amp and Keyboard Centre will also be providing goodie bags, as well as a GAK discount card! With regards to accommodation, BIMM can provide you with a list of local B&Bs, which may be useful. Please note we do not have our own accommodation. Tip: Brighton and Bristol get very busy in the summer months so early booking is advisable once your place is secured. You don't need to be an advanced player and we do accept all levels, however, the programme is not suitable for absolute beginners. The programme is geared towards beginners/intermediate players and we suggest the player needs to be comfortable in learning a song then playing in front of his/her peers. Call BIMM now on (+44) 0844 2646 666 to speak to us personally or email info@bimm.co.uk. This year promises to be a sell out so apply early to avoid disappointment. WHAT ARE YOU WAITING FOR?Testimonals:"i learnt so much in just four days and learnt from some of the best musicians. I've become a much better player." "I had the time of my life, the course was awesome!"